Comment: Our offices are located on the north side of the Home2 Suites OKC Airport facing the river. Currently, there is no awning by the door and during rain and snow, we get drenched trying to key in the code to open the door. Also, there is a sidewalk which we want covered as well that connects the parking lot to the front door of our offices. Comment: One seam has fallen out and the awning is leaking. The leak causes water to build up in a fold in the fabric. Need to repair the seam to prevent future rain from building up. Comment: I would like a very plain patio cover for my 10 X 14 wooden deck. 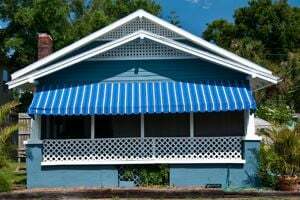 Oklahoma City Awning Companies are rated 4.84 out of 5 based on 45 reviews of 6 pros. Not Looking for Awnings Contractors in Oklahoma City, OK?